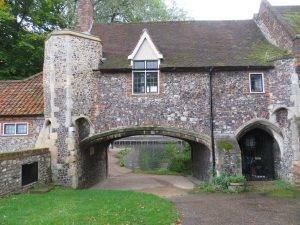 Norwich is one of our best preserved medieval cities, with something to delight around every corner and oodles of green space to roam around in. Norwich has been a thriving town since the eighth century, and by the time of the Norman invasion was one of the largest cities in England. The Domesday Book states that it had approximately 25 churches and a population of between 5,000 and 10,000. From the Civil War until the eighteenth century, it was second in size only to London, and a major trading centre with a history of wool-based wealth and subsequently the cloth industry. The city established wide-ranging trading links with other parts of Europe, its markets stretching from Scandinavia to Spain, and the city housing a Hanseatic warehouse. The geography worked perfectly, the River Wensum being a convenient export route to the River Yare and Great Yarmouth, which served as its port. A city that stood on its own, with a proud tradition of dissenting and individual political thought, Norwich’s geographical isolation was such that until 1845, when a railway connection was established, it was often quicker to travel to Amsterdam by boat than to London. In the latter part of the nineteenth century and twentieth centuries, it was relatively successful at moving into manufacturing, becoming well-known for footwear, transitioning throughout the 1980s and 1990s to a service-based economy. But its relative wealth declined as other cities had better access to raw materials and a large population. Happily, it was one of the first cities to take conservation seriously, with the establishment of the Norwich Society in 1923. 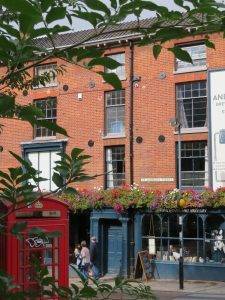 This has meant that despite having its fair share of multi-storey car parks, shopping centres and ring roads, it has retained both its historic core and green spaces. The corporation has also been leaders in the creation of parks and green spaces. After the First World War, it took advantage of government grants and constructed a series of parks as a means of alleviating unemployment. The city has won the ‘Greenest City in the UK’ award and also ‘The Best Place to Work in’. 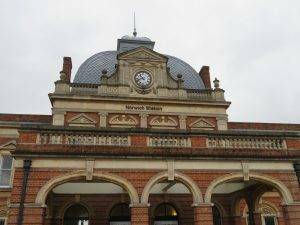 Norwich Station (1886) makes for a grand arrival, built as it is in a grand French Renaissance style. In Simon Jenkins’ words ‘the ticket hall hints at Versailles ballroom’. 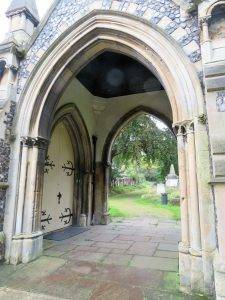 Our feet want to take us into the centre straight away, but our green space instincts take us up the hill instead to the Rosary Cemetery (1819), the first non-denominational burial ground in the country, reflecting Norwich’s important role in the history of non-conformism. 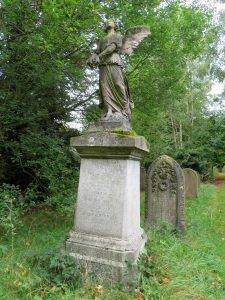 The Presbyterian minister Thomas Drummond paid for the land out of his own savings, partly as a protest against the law which said that all Norwich citizens had to be buried according to the rites of the Church of England in their local parish graveyards. 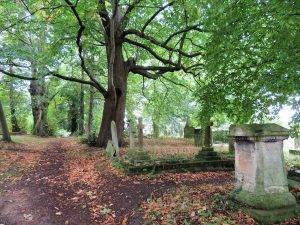 Today the cemetery is a wonderfully overgrown labyrinth of trees, passageways and toppling gravestones and the steep slope it is situated on adds to its intrigue. 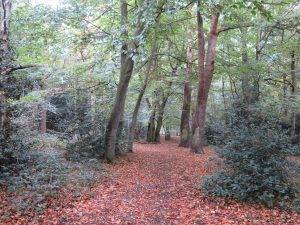 Next, we tramp through Lion Wood (9.2 hectares, 23 acres), about a third of which is ancient woodland, with the remainder dating back at least 200 years when the surrounding landscape was a mosaic of farmland and heath. Two steep-sided valleys carved into the woodland floor flow down from the North towards the River Yare in the South. It is a remnant of Thorpe Wood which was mentioned in the Domesday Book and was the hunting ground of the Bishops of Norwich and before them the King. We turn left down the hill at the Britannia Barracks (1887), a rather formidable building in the Queen Anne revival style. The view of the city from St James Hill is spectacular we found it a useful way to gain our bearings. 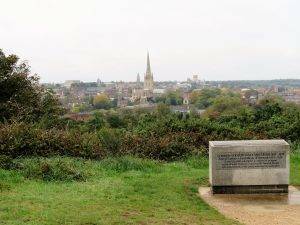 To the north (a very worthwhile extra 2km loop) is Mousehold Heath (81 hectares, 200 acres), a Local Nature Reserve and one of the few examples of heathland surviving the Victorian period in an urban area. This spot was the encampment of Robert Kett during the 1549 Peasants’ Revolt when they were campaigning against the enclosure of land depriving them of a subsistence. They stormed the city but were eventually beaten by forces of the king. Mousehold Heath was famously painted by a number of the Norwich school artists including John Crome and John Sell Cotman. Another artist, reflecting on its free access described it as ‘the property of those who have the privilege of Norwich birth’. 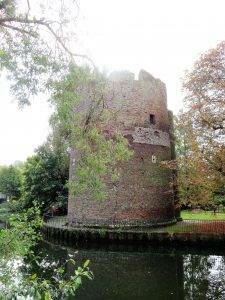 Coming down off the hill we follow the River Wensum south along the line of the old city wall. Wensum means winding in Old English, and you can see why – on the short stretch we take, it makes two ninety-degree turns. 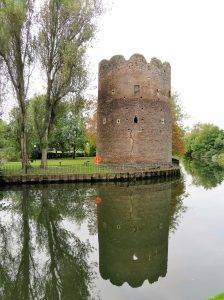 On the other bank is Cow Tower (14th century), built to defend the north-eastern approach to the city. It stood apart from the main city walls, close to the river where its height would have allowed it to fire onto the higher ground that we have just come from. 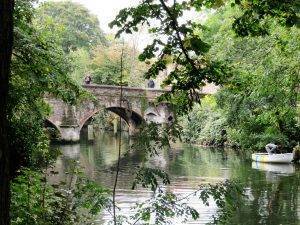 Next, we cross Bishop Bridge (1340), one of the oldest bridges in England. The Jarrold Bridge (2012), by contrast, has only been walked across for a handful of years, but is a structure of modern beauty, appearing to float over the river with little visible means of support. 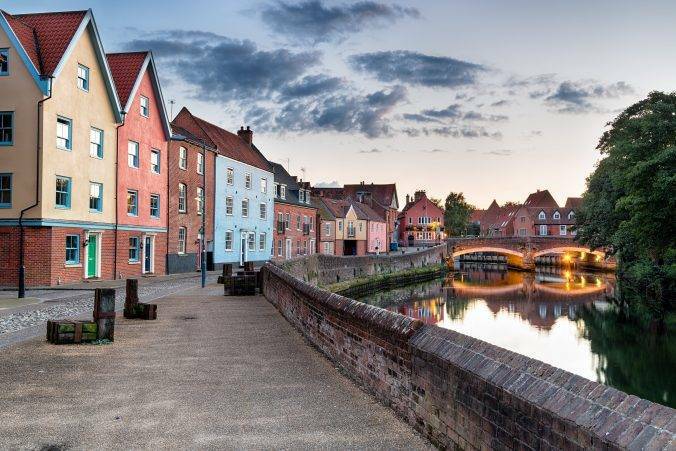 We stroll along the Norwich Quayside, which would have been at the heart of the city’s trade in medieval times, with warehouses and industrial activities. Colegate is full of historic interest. St Clement’s (15th century) light and simple interior is pleasantly unpretentious. Sadly, it is a ‘redundant’ church, one of many in the city, which is perhaps inevitable given that 58 parish churches have stood within the medieval city walls, most originally funded by wealthy wool merchants. 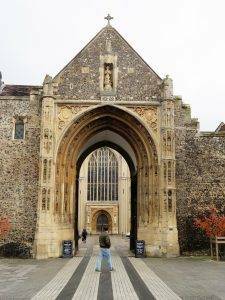 Although 27 of these buildings have been lost, either to the religious turmoil of the mid-sixteenth century or during the air raids of The Second World War, Norwich can still boast the greatest concentration of medieval city churches in Northern Europe. On our right, we peer up an alley to the Old Meeting House (1693). 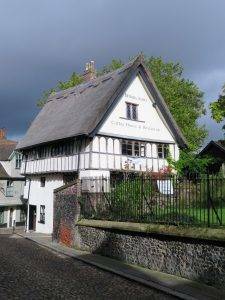 This is an active Congregationalist church, part of Norwich’s long tradition of non-conformism. Many of the leading Dissenters of Norwich were Congregationalists, and they included among their numbers some of the wealthiest and most influential members of local society. Life was repressive for the Dissenters, but in 1689 the Act of Toleration finally made it legal for them to build their own place of worship. A short way further on is the Unitarian Octagon Chapel (1756). Perfectly octagonal, so that no corners are distant from the pulpit, it pre-dates by 200 years the recent trend for ‘congregation-friendly’ spaces. 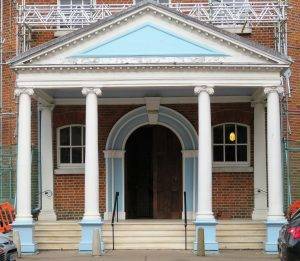 John Wesley described it as ‘the most elegant meeting house in Europe’. 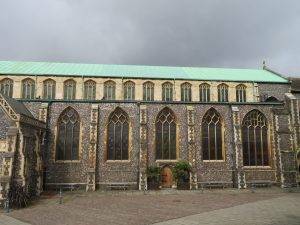 St George’s Church (15th century) is in front of us as we turn left down St George’s St. During the late medieval period this area was home to some of Norwich’s wealthiest wool merchants, and the quality of memorials and interior furnishings of the church reflects this prosperity. In the south aisle, there is a plaque to landscape painter John Crome (1768- 1821), founder of the ‘Norwich School’ of artists. Across St George’s Bridge is the Old Technical School (1891), now part of the Norwich University of the Arts. Its original aim was to ‘put people in the possession of such knowledge as would enable them to learn a trade’. It taught classes in carpentry, carving and cabinet making and drawing, while the Higher Grade School offered science and art classes. The history of Norwich University of the Arts dates back still further to 1845 when the Norwich School of Design was established to provide designers for local industries. St Andrew’s Hall and Blackfriars’ Hall (14th century) make up the most complete friary complex surviving in England. The centrepiece is St Andrew’s Hall, gloriously constructed in local flint, a vernacular that we see on many buildings and churches on our walk. St Andrew’s Church (15th century) is a working church and one of the largest in the city; its spire is a notable landmark. John Robinson became associate pastor here in the early seventeenth century. He was one of the founders of the Congregational Church and later became pastor to the Pilgrim Fathers before they sailed to the New World. Bridewell Alley is a quaint alley alongside the church, where you will find The Bridewell Museum, which tells the story of the city’s industries. Turning right at the top, we walk along Bedford St and then the curiously named Lobster Lane – apparently, there was once a pub of that name here. We turn left up Lower Goat St, part of the medieval structure of streets, very quaint and full of interesting independent shops. On our left is The Guildhall (15th century), the largest surviving medieval civic building in the country outside London. It was the seat of city administration until 1938 when it was superseded by the art deco City Hall opposite, a building which I love but is not popular with everyone. 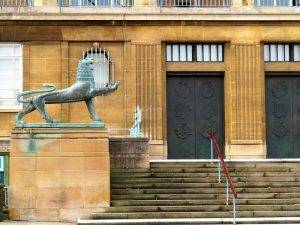 Its detailing is especially good – the sleek bronze lions guarding the entrance to the three huge bronze doors; and inside, furniture, fine panelling and light fittings and other details all designed by the architects themselves and still intact. Special bricks were fired for the building, each one being two inches longer than usual to better reflect the proportions of the finished building. We pass in front of the Guildhall through the charming Memorial Gardens, also part of the new City Hall scheme, with a war memorial by, yes, you’ve guessed it, Sir Edwin Lutyens. Below us is The Market with its multi-coloured awnings, founded in the latter part of the eleventh century and the largest open-air market in the country. Then we head left down through the churchyard of St Peter Mancroft (1455) onto Gentleman’s Walk, a fashionable avenue in Georgian times, and through the splendid Royal Arcade (1899). 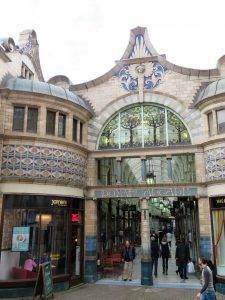 According to Sir John Betjeman, ‘George Skipper (the architect of the arcade) was to Norwich what Gaudi was to Barcelona’. 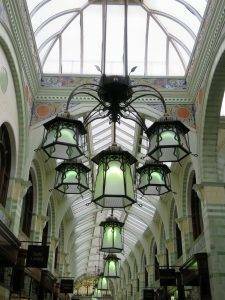 Arcade shopping was very much in vogue at the time and this arcade brought the fashionable, exotic and continentally influenced architecture of Art Nouveau to Norwich for the first time. On a sunny day, Norwich Castle (11th century) positively gleams on its mound, and we walk around the top, enjoying great views in all directions. It was founded in the aftermath of the Norman conquest when William the Conqueror ordered its construction because he wished to have a fortified place in this important city. Its current good condition is thanks to a very thorough Victorian restoration that kept broadly to the original design. 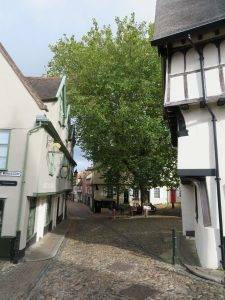 We then make our way back via Opie St to Andrew’s Plain, ‘plain’ being a local name for an irregularly-shaped town square, which leads into Elm Hill, the most complete medieval street in the city. Ten mayors have lived here, but a century ago it was almost derelict; thankfully, after much campaigning by the Norwich Society, the council saved it. 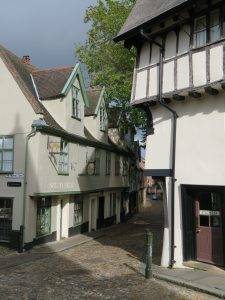 Many wealthy merchants had their houses facing Elm Hill with their factories and workshops at the rear with access to the river for goods in and out. We make a worthwhile little detour round Tomblands before heading into the cathedral close. Tomblands sounds like the name of an old cemetery, but in fact derives from the Saxon word tom, meaning open space, and was originally the pre-Norman marketplace. Heading through the Erpingham Gate, we look onto the west end of the cathedral (1145), with the spire behind looking curiously disconnected from it, perhaps because it is so high, the highest in fact in England other than Salisbury. 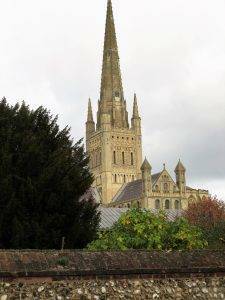 It is the most complete Norman Cathedral in England, and the inside is a thing of splendour. The cloisters are also very extensive, and in the grassed centre, there is a labyrinth. The Cathedral Close is one of the largest in England and contains more than 80 listed buildings, some of which are still connected to the cathedral, but many of which are available to rent. 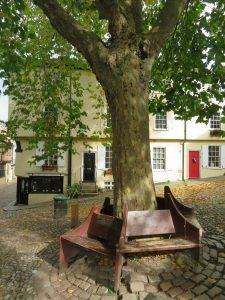 It really does offer peace and quiet in the centre of the city, complete tranquillity, there’s even a cathedral Herb Garden to enjoy. 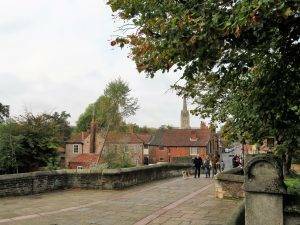 Pulls Ferry (15th century) was the route for the stone used to build Norwich Cathedral. The stone came from France up the rivers Yare and Wensum. A canal, built by the monks, used to run under the arch, where the Normans ferried the stone and building materials to be unloaded to the front of the construction. Then we head back along the Riverside Walk to complete our journey. Go up the steps through the Compleat Angler, turn left over Foundry bridge and you are back at the station. Café Britannia, Britannia Rd, NR1 4LU. Social enterprise, with great views over Norwich. 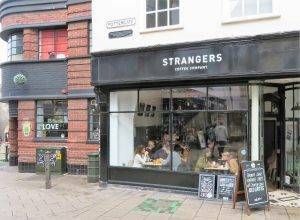 Strangers Coffee House, 21 Pottergate, NR2 1DS. Top quality coffees, roasted on site. Briton’s Arms, 9 Elm Hill, NR3 1HN. A fourteenth-century building and garden balcony. Norwich Castle Museum and Art Gallery, NR1 3JU. Many paintings from the Norwich School of Art. The Bridewell Museum, NR2 1AQ. Tells the story of the city’s industries. Stranger’s Hall, NR2 4AL. 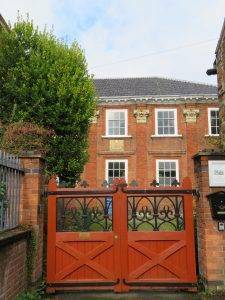 A fascinating museum of domestic history. Thanks for that. Good thought! Thanks for your comments. I hope you are enjoying the book. Type in Urban Rambles Norwich to your phone – map is at the start of the section, double click bigger and it will fit the screen of your ‘phone. Maybe best to print out the detailed directions before you set out at end of the section. If your map is not GPS enabled (I think it may depend on the type of ‘phone), then if you are walking with a partner/friend, suggest they also have a general GOOGLE map open which will show exact position. Kind regards, Nicholas.